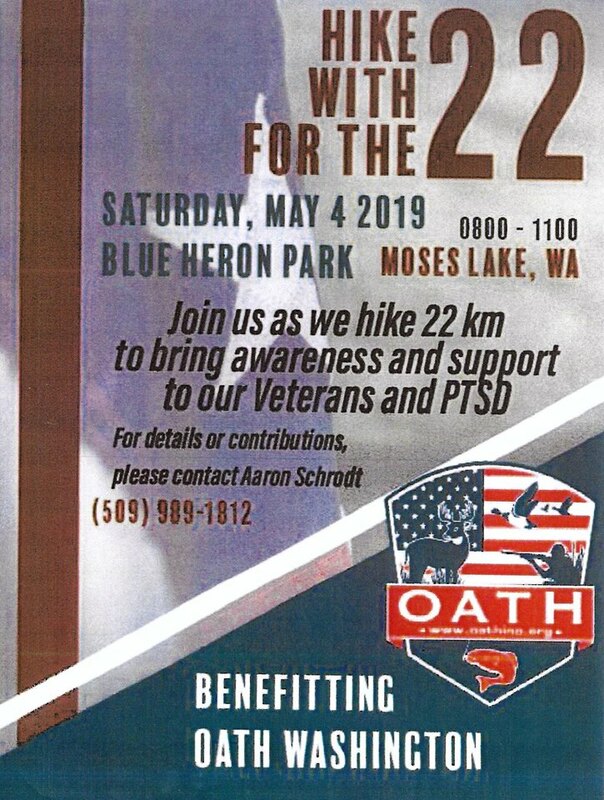 Come join us for the 2nd annual HIKE 22 WITH 22 FOR THE 22! Approximately 22 veterans a day commit suicide. This hike will be focused on suicide prevention and awareness, not only for the veterans fighting PTSD and transitioning to civilian life, but also within the civilian community. We need to make it known that no one has to fight their demons alone. We are hopeful that our efforts will help reduce this statistic and bring light to ANYONE wanting to call out for help but can’t or isn’t heard. This hike will consist of a 22km (~13.5 miles) hike through the city of Moses Lake, WA with designated hydration stations along the route. The hike begins and ends and Blue Heron/Old State Park and the turnaround point is Cascade Park. Please hike within your physical capability. No one is required to carry 22 kg. Additionally, if you would like to be part of a relay team that splits the hike into 3 or 4 sections, please contact the event POC.